The default report template that you’ll see for your ads it’s pretty useful, but can also be incomplete and confusing. 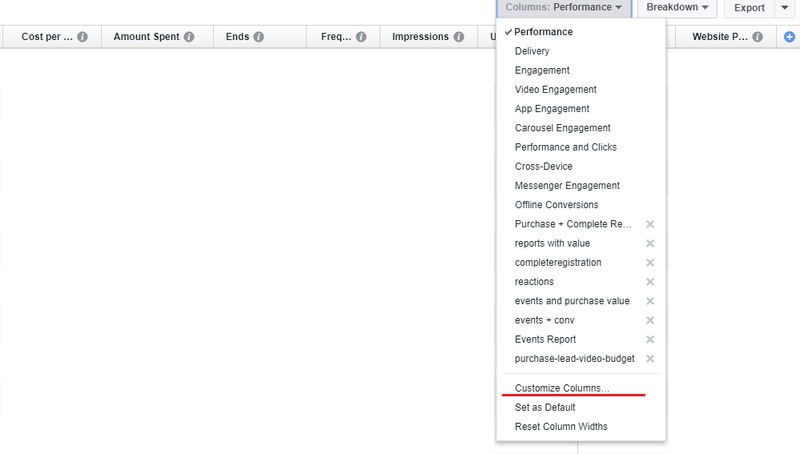 If you want to really understand what’s going on with your ads you must customize the columns of the report. If you’re running campaigns optimized to deliver results based on pixel events this step has a crucial importance for a correct assessment of your results. Let’s assume that you’re running a campaign for your WooCommerce website optimized for the Purchase event. Facebook will deliver ads to people most likely to buy something from your site (the Purchase event is triggered once a visitors performs a transaction and lands on the Thank You Page). However, your Facebook Pixel will also track all other events that you have on your website. If you’re using the PixelYourSite plugin to manage the Facebook Pixel you probably have other events inside your code: ViewContent (on product pages), AddToCart (on click to the button and on cart page), InitiateCheckout (on checkout page) and any other event that you created. Depending on your ad type, they might appear as conversions in the default reports, under results (the number of actions as a result of your ad). This is where Custom Reports come into rescue. 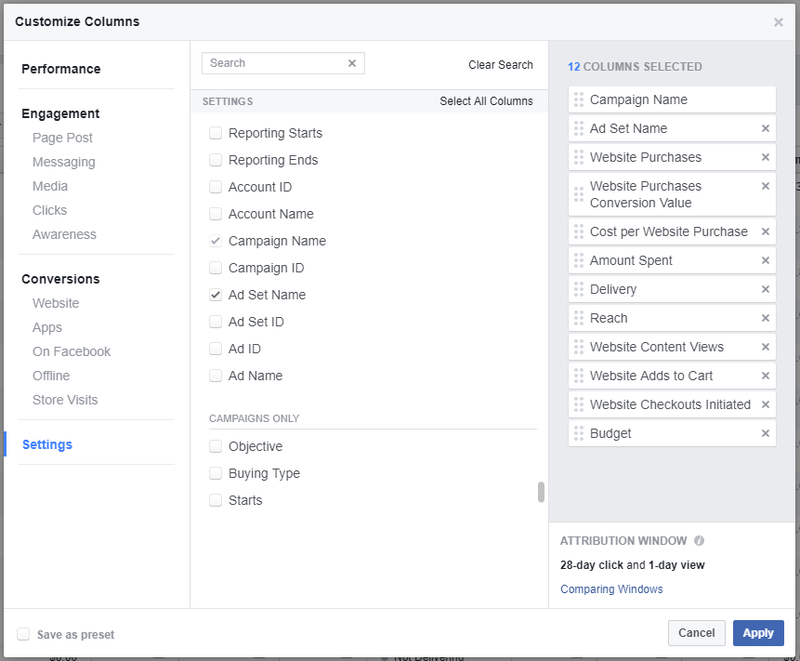 To really understand your ads results, you will have to use this very powerful feature of the reporting system: Customize Columns. 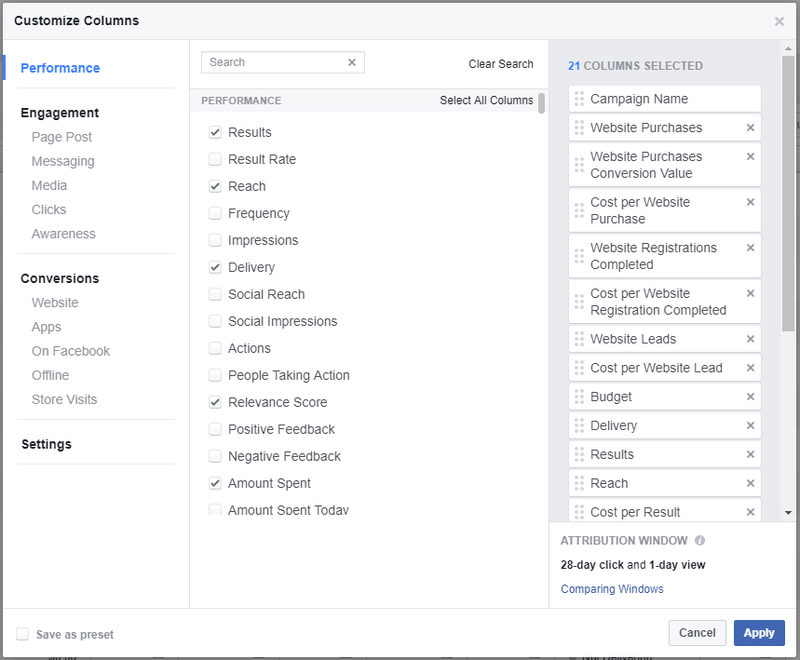 Using the customize columns option you can create in-depth reports that can show you exactly what results your ads have. This can be anything, from a custom conversion to a standard event, but also things that happen on Facebook, like video views, post or page likes. Performance: key data about your ads performance, like results, reach, frequency, relevance score (ad level only), the amount spent, amount spent today, etc. Tip: select only the columns that can be of real interest for you, otherwise it will be complicated to read the report. Try to keep things simple. To delete a report click on the X next to it. Only your custom reports can be deleted, not the Facebook predefined ones. Saving your reports is not mandatory. Sometimes you just want to make a quick analysis that requires customizing some columns. See how action-based results (such as clicks and conversions) attributed to your ads compared across different lookback periods. This can help you understand when people most often take action after interacting with your ads. This type of reporting can give you some useful insights about how long it takes for your ad generated visitors to convert. Sometimes you will be surprised by the results. Why is this important? If you understand how long it takes until someone decides to convert, you can create smarter retargeting campaigns that can improve your overall results. Once you have your custom reports up and running you can use another interesting feature: breakdown. You can break down your reports By Delivery, By Action or By Time. I encourage you to play with this option as well because it can help you find interesting facts about how your visitors interact with your ads. 3. In the right side menu, drag and drop to rearrange the columns for better reading. You can also delete unnecessary columns, to have an easy to understand report. Some columns will be added there by default and you probably won’t need them. 4. Check “Save As Preset” at the bottom of the popup window, type a name for the report template, and click Apply. It’s probably a good idea to set up this report as your default one, so you will have it loaded every time you open your Ads Reports page. Following the same steps, you can create a countless number of useful reports and adapt them to the very particular needs that you might have.